Orion dominates the winter sky, flanked by Taurus the Bull on one side and Canis the Great Dog on the other—three key constellations for the Hopi and prehistoric Pueblo People of the American Southwest. When these stars appear in the entryway of the kiva roof, they synchronize the sacred rituals being performed below. Here we see how a complex ceremonial cycle mirrors the turning of the heavens. Stargates, UFOs, Indian Mothman, natural psychedelics, cannibal giants, psychic archaeology, earth chakra lines, and the Hopi-Egyptian connection—this book is packed with fascinating and little-known facts about one of the most mysterious and secretive tribes on the North American continent. You will come away with a deep appreciation of the way the Ancient Ones viewed the world above. Chapters include: What is a Kiva? 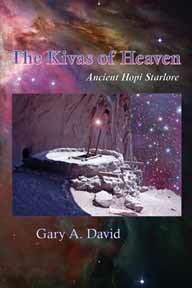 ; Stargates in Antiquity; New Mexico’s Orion Kivas; Colorado’s Orion Temple; Hopi Flying Saucers; Arizona’s Psychic Archaeology; Hopi Kachinas and Egyptian Stars; 2012 Supernova? ; Book of Revelation and 2012; Indian Mothman and Sacred Datura; Tales of Giants and Cannibals; Chaco Canyon: Mirror of Sirius; Dog Stars in the Land of Enchantment; The Chaco-Chakra Meridian; Seven Spiritual Cities of Gold; Orion’s Global Legacy; more.